Wasn't sure where to post this query but wanted to ask if there are any historic precedents for Helms other than helmets, I know in ecclesiastical heraldry its common to see various types of hats. So what if an armiger wished to use something a little quirky such as a Fez or a Topper? 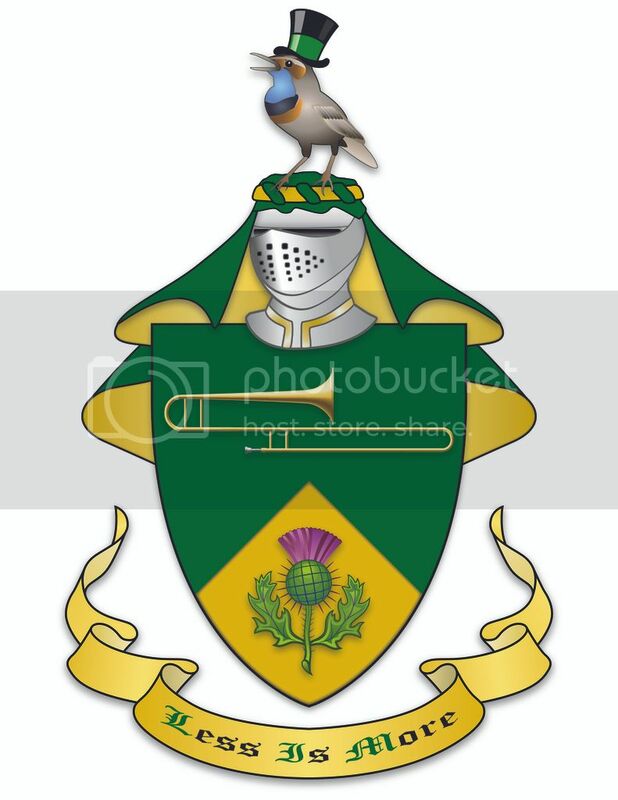 I did do a brief google and did spot this rather amusing blazon but in this instance the hat is featured on the crest rather than as a helm as such. Re: Helms and other head coverings??? The link you provided merely shows a a pet monkey wearing a fez while playing a tin whistle or somesuch. There are a few examples of non-traditional helmets. Off the top of my head I can think of eastern helmets with hanging mail "curtains" and one example of a jet fighter pilot's helmet. There has been a recent extended discussion re: heraldic headgear other than (in lieu of) the usual helmet and crest on the American Heraldry Society forum. Without repeating in detail (many posts), the general but not unanimous conclusion was that beyond the long-standing use of clerical hats and mitres in lieu of helmet and crest, alternative headgear probably wasn't a good idea. There was a minority view in favor of academic headgear for advanced degrees (mortarboards / bonnets). IIRC no one there was in favor of other modernor innovative headgear, seen as either anachronism or confusing or both. The rendition is by Michael Richards and the concept of the Fez is to add an element of multiculturalism & steampunk/anarcho-dandyism. Last edited by Andrew Kerensky on Fri Apr 17, 2015 8:47 pm, edited 1 time in total. While the arch-conservatives amongst us recognise an heraldic anarchist at 1,000 paces, I must point out that the crest you have now emblazoned does not match the blazon. Anarchy or not your crest as depicted is simply wrong. Of course your crest might have signed up with the Shriners, but that does not give birdie-nam-nam the right to wear his fez when perched on your helm. I am among those who believe some alternatives to the traditional helm may have merit - particularly academic regalia. Generally, however, I do believe that alternative headgear needs to be consistent with being alternative, in that.. a Fighter Pilot would not wear a crest or mantle.. so if one wishes to use a Fighter Pilot's helmet, the crest should perhaps be "floating" or off to the side or not in existence in that particular display. And, I agree with Chris. Because you've registered your arms with South Africa, Andrew, your new emblazon is not valid with your registration. You are, of course welcome to assume the arms with the change in a number of other locations - but that pretty much makes your registration something of a waste of time in the first place if you wish to "play" with the design now.